This charming and surprisingly spacious, two double bedroomed cottage is believed to date back to the 18th Century and offers a rare opportunity as this well presented home also offers a large plot, parking for several cars and a detached double garage which is a very seldom found combination indeed. The property is full of character with exposed beam, latch/brace doors and lovely fireplaces. Countryside walks and Loughborough's facilities are both within easy reach of this fantastic home. General Information - The hamlet of Cotes is a delightful cluster of homes set in the heart of Charnwood. Ensconced within green woodland and farm land it enjoys easy access to Loughborough town centre and the cities of Leicester and Nottingham with convenient bus routes. Ideally located for travel routes via M1 and Nottingham Airport for employment, plus access to Loughborough town amenities, midland mainline train station only 1 mile away plus leisure facilities and endowed schools. Epc Rating - An EPC has been carried out on this property with the resulting rating E. For a copy of the full report visit www.EPCRegister.com using the postcode of the property to search. Frontage - The property sits back behind a shallow grassed bank with shrubs and bushes to the front elevation. Living Room - 3.87m x 3.89m minimum (12'8" x 12'9" minimum) - A delightful living space with side corridor area leading off to the kitchen and dining room and feature fireplace to a recess. Heavily beamed ceiling and with a dual aspect having double glazed windows to front and side allowing lots of natural light giving the room a relaxing and welcoming feel. Dining Room - 3.87m x 3.86m overall (12'8" x 12'8" overall) - A charming cosy room, ideal for intimate dining, again with feature fireplace and beamed ceiling. Double glazed window to the property's front elevation and recess with door leading to the first floor stairwell. Sizes into recesses and fireplace. Kitchen - 3.82m x 1.92m (12'6" x 6'4") - An attractive galley kitchen fitted with modern units and work-surfaces and with two double glazed windows overlooking The rear garden. Ample appliance space and one and a quarter bowl sink with drainer. Bathroom - 2.41m x 1.92m (7'11" x 6'4") - With a three piece suite and electric shower over the bath, tiling to parts and two double glazed windows to the property's rear elevation. First Floor Landing - With storage cupboard over the stairwell and doors leading to the following two rooms. Master Bedroom - 3.99m x 3.87m (13'1" x 12'8") - A really light and spacious room with semi-vaulted ceiling and windows to three walls plus feature stove this is a lovely master room with a calm and relaxed feel which purvades this property throughout. 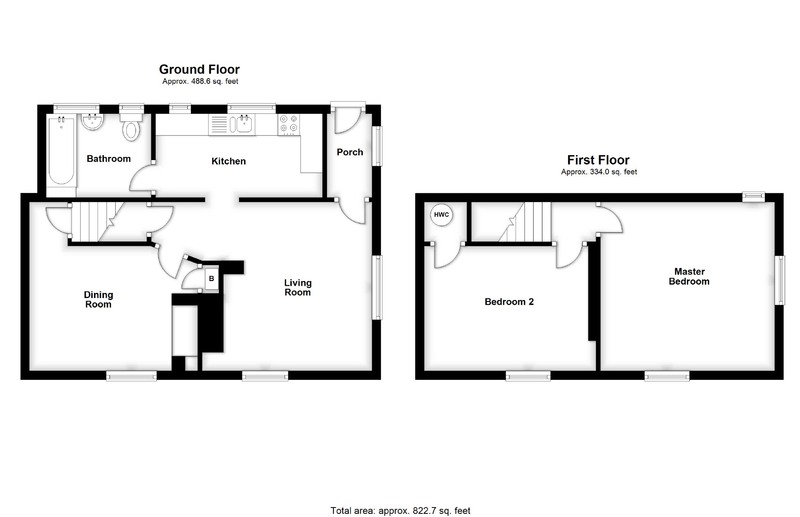 Bedroom Two - 3.94m x 2.86m (12'11" x 9'5") - A further double bedroom with built in storage off and single aspect to the property's front elevation. Rear Gardens - The gardens are this property's surprise feature being attractively planted and a generous size giving potential for expansion subject to any necessary consents of course. There is a 'secret garden' tucked away to find and lawned spaces for enjoying the sunshine* There is also a greenhouse and a large parking/turning area behind the double garage which is situated to the foot of the plot. To the immediate rear is a yard area with side entrance gate and timber canine run/storage. Summer House - Of timber construction and attached to the garage wall this handy outside space is idea for relaxing and enjoying the garden on a summer afternoon. Detached Double Garage - With twin access doors plus internal lighting and power this is a wonderful facility for anyone and could serve as storage, workshop space and even potentially convert to an annex subject to any necessary consents from the local authority. Important Buyer Notice - All measurements are approximate and for guidance only. These particulars have been created by us and checked by the property owner for accuracy although this cannot be guaranteed. Services, fixtures, fittings and appliances (where permanently fitted) have not been tested and no warranties can be given. If there is any particular point of interest please make enquiries before travelling to view the property. Any plot or floor plans are designed to give a fair reflection of the property but are not guaranteed to be accurate and you should check with your legal advisor or make enquiries via Moore & York if there are any points you wish to have clarified.